Ah, finally the weekend and I’m looking to make it a productive one furthering on my de-cluttering with a trip to the Goodwill and finally getting my old laptop and all the accessories delivered to and set up for my sister. This week has been a tough one at work and playing catchup at home, I’m happy to put it behind me. While sorting out our office, I found one of my favorite childhood toys that somehow still works. And it still has my name written on the back using a nursing Sharpie I swiped from my mom. I got this as a birthday gift from my dad when I was 11 visiting him in California for the summer, I lived with my mom in Florida at the time. Since I spent a lot of time on planes going back and forth, many hours were spent playing Super Mario, Tetris, Paperboy, Ren & Stimpy, etc. I fired it up to play today and wondered how I could stand the screen for so many hours, lol. Think I’ll turn it into wall art for the office along with hubby’s collection of classic PC game boxes. I still play video games occasionally, except first-person shooters because they make me want to ralph. I mostly play Mario on the Wii, racing games on the Xbox and a little of everything on my iPhone. When it comes to a healthy lifestyle, Fimreite said people ought to pay attention to their nervous system and focus on good nutrients, stress reduction, exercise and getting their body to be less reliant on medications. 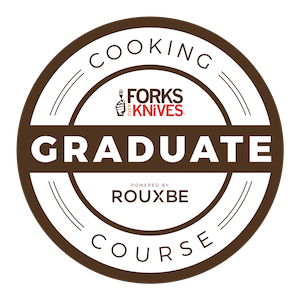 Stress reduction is still an issue for me, though there has been a lot of improvement in that area just over the last year, not easy as high-strung Type A seems to run in the family. I’ve become more convinced though that stress and other mental miseries are equally damaging to health as a poor diet. Anyway, my smoothie this morning was extra smooth with Sunwarrior protein powder and Running Food. 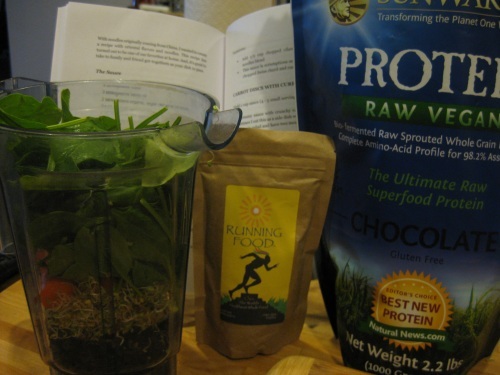 I’m still trying out Running Food in my smoothies and really liking it, it seems to pair better with Sunwarrior protein powder over hemp powder because they both are closer to a fine powder and blend smoothly together. 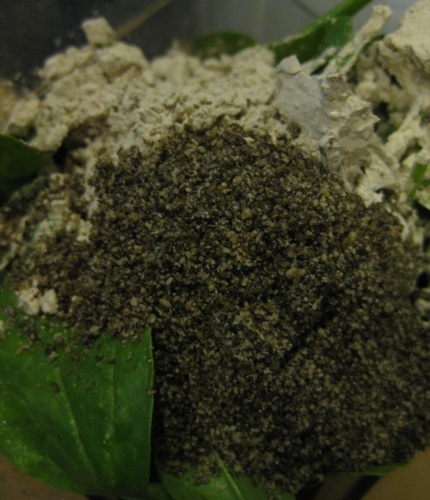 Running Food is black chia seeds in a powdered form for easy mixing and consuming. 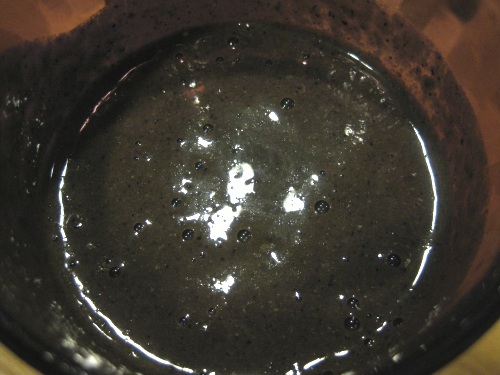 Chia seeds are a staple in my smoothie about 4 times a week and always before long morning runs because they seem to satisfy me longer with energy while not feeling bloated or weighed down with a heavy breakfast. 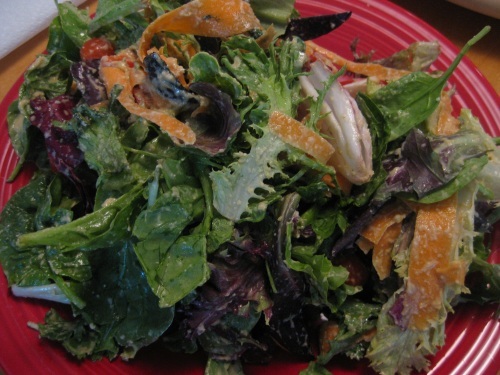 For lunch yesterday, I had the perfect light salad. 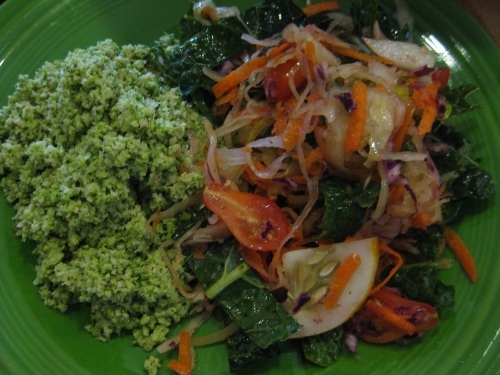 The dressing was a creamier version of Ani’s Orange Ginger by adding walnuts into the blender that added a richer flavor and coated the leaves nicely. 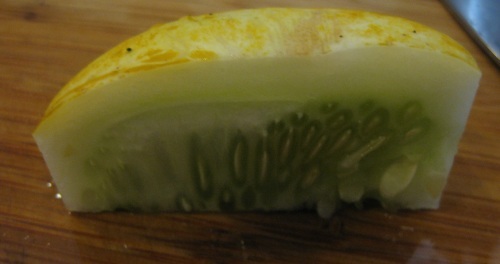 It’s a lemon cucumber that looks a lot like a cucumber inside with larger seeds. 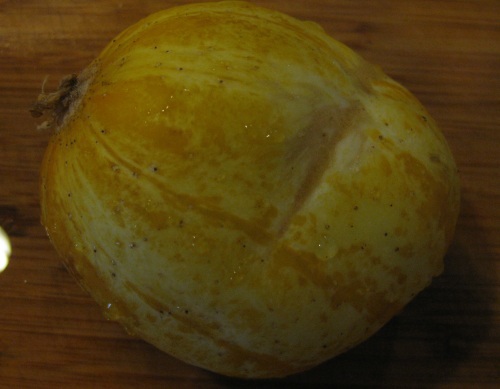 It’s about the size of a large apple and could be eaten like one raw. 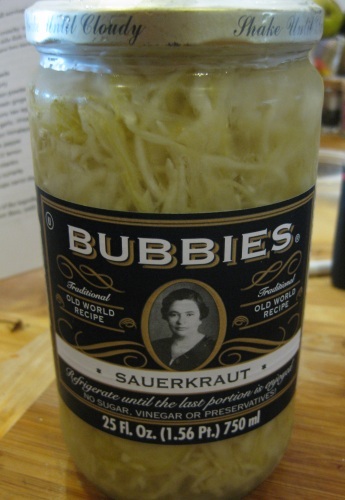 A co-worker brought them in from their garden and I just had to try it – tastes like a sweeter cucumber and made a great addition to a dinner salad along with a new sauerkraut I picked up at Whole Foods. 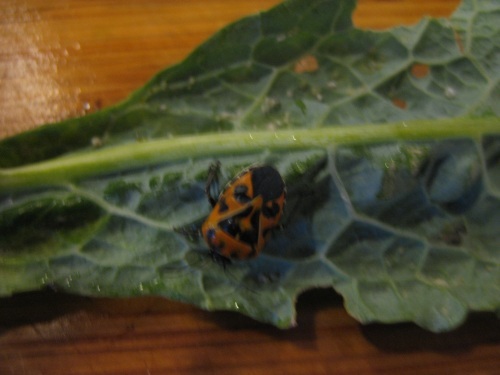 I plucked kale from my garden for the salad and brought in another friend I had to evict. Sorry for the blurry pic – fast little bugger! Anyway, the salad included kale, sauerkraut, red cabbage, lemon cucumber, cherry tomatoes and carrots I grated on a cheese grater and managed not to grate my thumb this time. It went well with Protein Punch Broccoli to complete the meal. Mmm, then watermelon for dessert. Oh man, that game boy brings back so many memories! I had one that my parents would only let me use when we were traveling! The lemon cucumber is so interesting! Never heard of or seen one!!! SO funny you found your gameboy! I remember those, I had one too, loved that thing!!! Hope you have a great weekend love! The running foods stuff sounds really great! I think stress is such a big issue when it comes to health- i’m a major stresshead. I’m on summer hols from uni at the moment and I think I’ve spent most of it being stressed about how much I have to do! I pressure myself a lot and I seem to be getting more of a stresshead as I get older; need to sort that one out… maybe I’ll buy a good book on stress management. 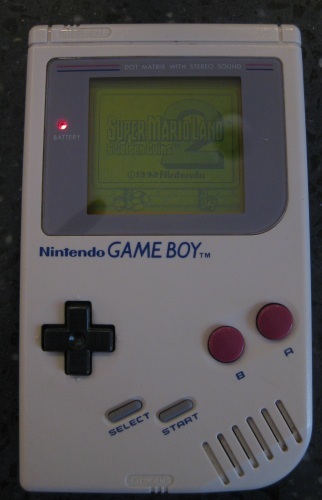 Super Mario, Tetris, Zelda = my early teen years!!! OMG LOVED THEM And could play for hours!!! The lemon cuke, so cute and fun! I love the description, right up my alley! running food. never heard of it but do love sun warr choco. The best choco plant based protein out there, IMO. Have a super week hon!! !